The Technique spoke with Harlen Shackelford, Sports Editor of Florida State University’s student newspaper, FSView, to preview this week’s football game between the Jackets and the Florida State Seminoles, a rematch of last year’s ACC Championship game that ended in a 37-35 loss and sent the undefeated Seminoles into the playoffs. Technique: Everett Golson’s last season at Notre Dame was marred by turnovers — 14 interceptions — but he’s yet to throw a pick this season. Should Yellow Jacket fans attribute this to maturity, a better-suited offensive system or both? FSView: Both. This entire offense is the polar opposite of what it was a season ago with respect to turnovers. The Seminoles gave the ball away a whopping 32 times in 2014, which checked in at second most in the country. Golson’s maturity behind center should certainly be noted. But this offense as a whole has played clean football all season long. Technique: Speaking of which, the ’Noles don’t seem to have skipped a beat without former quarterback Jameis Winston under center, who averaged about 33 points per game in 2014 and thus far in 2015. Seeing that Winston made his fair share of poor reads last season, would you say that Golson has actually improved the offense? FSView: This is certainly an interesting question. I’ll say that Everett Golson has allowed much of the FSU faithful to rest a little easier as the offense has yet to turn the ball over this season (knock on wood). While Winston certainly had big play ability every time he took the snap, Golson has perhaps been a better manager of the game. All that being said, it would be a welcoming sight to see the redshirt senior throw for over 350 every game like he did against a respectable Louisville defense. Technique: Dalvin Cook had a fantastic performance last weekend despite being hampered for a good portion of the game with a hamstring injury. Will it keep him out this weekend, and if he’s limited, would the lack of experience in the Seminoles backfield — sans Mario Pender, who’s recovering from a lung injury — be of concern to the coaches? There is also the possibility that Pender may eventually wind up seeing a medical redshirt. That being said, Cook’s hamstring is of utmost importance to this team’s success right now. The ‘Noles proved they could survive without the Heisman hopeful against a formidable Wake Forest defense. But that game certainly was far from a cakewalk without Cook. Technique: Paul Johnson is anything but risk-averse, and the Jackets have ranked No. 5 in the nation thus far, going for it on 18 fourth downs. The Seminoles, on the other hand, have done so only thrice. 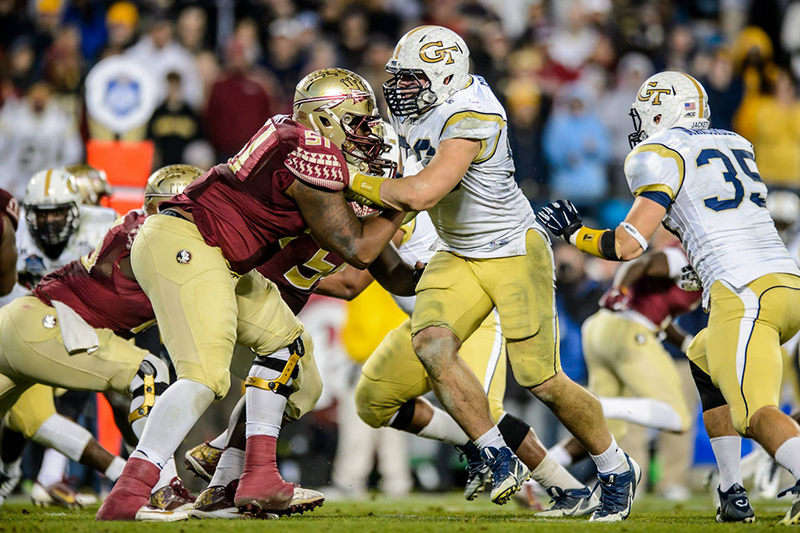 Do you expect Jimbo Fisher to match Johnson’s aggressive style on Saturday? FSView: I don’t expect Fisher to do anything that could potentially be detrimental to his team’s success. This Florida State team has seen improvements with almost every game. Golson’s 372-yard performance through the air against Louisville really embodies these improvements. Dating back to the 2013 season, the ‘Noles have went for it on fourth down just 13 times compared to Tech’s 18 fourth down attempts halfway through this season. Technique: Who are some under-the-radar FSU players we should keep an eye on this Saturday’s game? FSView: Javien Elliott may not be “under-the-radar,” per se, but with Trey Marshall’s recent injury that will sideline the defensive back for the foreseeable future, it should be worth keeping an eye on the former walk-on. Elliott came up huge for the Seminoles with an opportune interception against Louisville after Trey Marshall went down with an injury. Technique: Give us a score prediction for the game this weekend. I like the ‘Noles in Atlanta. FSU wins it 41-24. FSView: Things could get interesting if Cook is sidelined for a significant amount of time because of his hamstring, though.